On Saturday, 15 December, Deacon Matthew Markewich was ordained to the Holy Priesthood. The Holy Spirit led both Father Matthew and his wife Rebecca to Orthodoxy while college students at SUNY Albany. Both converted to Orthodoxy while attending Saint Basil’s Church under the spiritual guidance and mentoring of Archpriest Peter Olsen, parish rector. Later, they were married in the church. 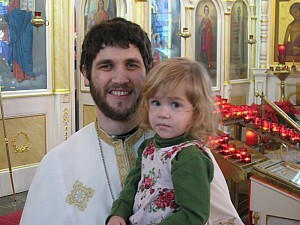 Having completing his studies at Saint Tikhon’s Orthodox Theological Seminary, Matthew was ordained to the diaconate at Saint Basil’s Church and now has been ordained to the priesthood. This was a momentous occasion for the parish as it marked the first ordination to the priesthood to take place in their church. In addition, Father Matthew is the first parishioner of Saint Basil's to be ordained a priest. The Divine Liturgy and ordination were celebrated by His Grace, Bishop Michael. Serving with Bishop Michael were: Archpriest Peter Olsen, Archpriest Alvian Smirensky (New Skete Monastery), Archpriest Igor Burdikoff (Christ the Savior Church, Ballston Lake NY), Archimandrite Athanasius Mastalski (Saint Tikhon’s Monastery), Priest Leonid Schmitt (Saints Peter & Paul Church, Syracuse NY), Priest Emmanuel Mantzouris (Saint Basil’s Greek Orthodox Church, Troy NY), and Priest Mark Lichtenstein (Holy Trinity Cathedral, Camp Hill PA). Also assisting were Deacon Panagiotis Tekosis (Saint Tikhon’s Monastery), Deacon Konstantine Kasovac (Saint Tikhon’s Monastery), and Deacon Mark Bohush (Saints Peter & Paul Church, Endicott NY). On this blessed day, Archpriest Peter Olsen was awarded the “palitza” (liturgical sword) by Bishop Michael in recognition of his 29 years of commitment, love and dedicated service. A luncheon in honor of Father Matthew, Matushka Rebecca, and their children was held at the parish Church Center where the faithful offered expressions of love and joy. The faithful of Saint Basil’s were additionally blessed by having Father Matthew serve his first Divine Liturgy as a priest on Sunday, 16 December.